to reach the much-lower handlebars. 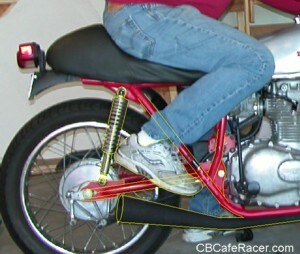 The solution was to adapt a pair of racing-type rearset pegs from a Honda CB600 Hurricane. Of course, nothing comes easy. To design a bracket to hold them in place, I sat on the bike and put my feet where I thought they should rest, then had my wife take photos. Those were inserted into AutoCAD and I traced the outline. 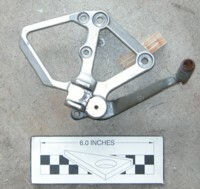 I took photos of the rearsets themselves and traced them. The little checkerboard pattern allows me to scale the photo at exactly the right size. 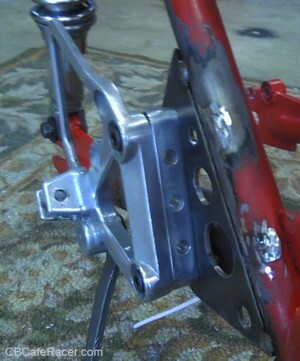 With all that done, it was easy enough to put the rearsets where they needed to be and designed a bracket to match. I printed the drawing out at full size, then used it as a template to cut the actual pieces. A few holes and a little grinding later, I had a pair of brackets. Easy, right? Here's how they looked tacked into place. Of course, it took some fiddling and adjustment and re-tacking to get them into the right place, then add some reinforcement gussets behind. 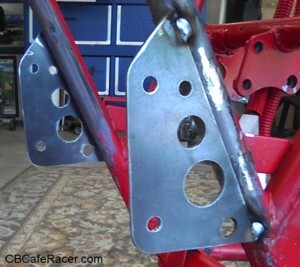 With the brackets in the right place, I had to make some standoffs for the rearsets themselves because they were a little too close to the swingarm. I used some aluminum bar stock, drilled the mounting holes, then added some "lightening holes" for visual appeal. Here's the final assembly. Don't ask me how much time it took to make because it was far more than I'd like to admit. If you really want something custom, and done right, this is what it takes. The next time you're at a car or bike show, look for things like this and you'll realize just how hard it was to make it look clean and simple.